Brand new, high resolution, 3D multicomponent seismic data from PGS has enhanced the geological understanding of one of the last remaining frontier basins in the far south-west Barents Sea. Location map showing survey area and location of seismic section (red line). The far south-west Barents Sea is one of the few remaining frontier basins. There is little exploration activity and the data coverage is sparse. Until now, almost all existing seismic data was 2D, of variable data quality and as a result, the geology and hydrocarbon potential of the area is not fully understood. PGS has now covered parts of this area with the first 3D GeoStreamer MultiClient broadband seismic dataset to enhance the geological understanding of the area and as a tool for unlocking new potential in this virtually unexplored and exciting part of the Norwegian Barents Sea. Through advances in data acquisition and imaging, and building on experience of acquiring data in the Barents Sea, this newly acquired dataset illuminates the geology and the exploration potential. The multicomponent seismic survey was acquired in 2017 and is processed with an innovative workflow using complete wavefield inversion (CWI). This is a processing flow developed by PGS which integrates advanced technology for high-resolution velocity model building and depth imaging using reflections, refractions and multiples. The new high resolution 3D seismic data is revealing geological details never seen before in this area thanks to the acquired broadband data and the state-of-the-art imaging workflow. Figure 1: Seismic section extending from the Finnmark Platform and the Troms-Finnmark Fault Complex in the south-south-east, crossing the Harstad and Tromsø Basins and ending towards the Senja Ridge in the north-north-west. The fullstack KPSDM stretched back to time seismic data is overlaid by the detailed refraction FWI velocity model. 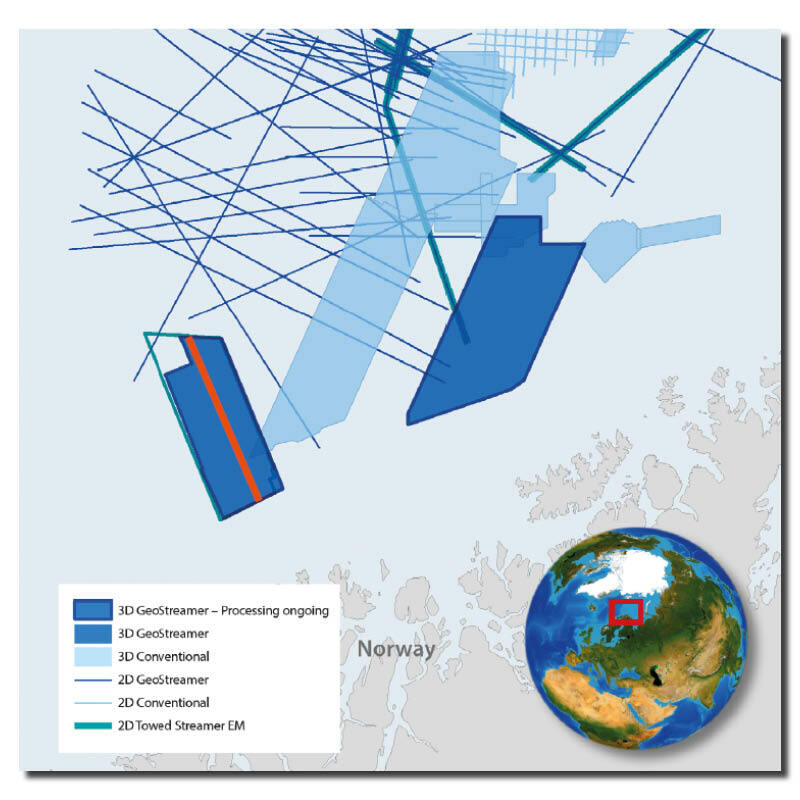 According to the Norwegian Petroleum Directorate, almost half of the undiscovered resources on the Norwegian Continental Shelf are to be found in the Barents Sea. It is still deemed to be a frontier basin, with only parts of it considered to be semi-mature (e.g. Hammerfest Basin, Polheim Sub-platform and Hoop Fault Complex). The availability of modern, high quality 3D seismic data over the area will help highlight the exploration potential that exists in this vast, underexplored, complex geological province. High resolution data provides the missing details and with the CWI workflow implemented in this survey, the overburden heterogeneities, common within the Barents Sea, are resolved and the imaging of features beneath is vastly improved. The PGS17011NBS dataset is the most recent addition to the PGS MultiClient data library in the Barents Sea and is positioned to open new arenas and de-risk future exploration drilling. Through several seismic acquisition campaigns in the Barents Sea, PGS have refined the acquisition parameters and processing workflows to produce a dataset that tackles the imaging challenges in this area, whilst retaining the integrity of the data. This campaign started in 2011 with a 2D multicomponent acquisition. In subsequent years, the company has trialled various acquisition technologies and survey design parameters to determine the optimal parameters to image the complex geology beneath the shallow heterogeneities. Figure 2: Preliminary advanced processing to extract energy within the horst blocks. Kirchhoff migrated fullstack data (top and lower left image) including SWIM data blended in the top part of the section and preliminary wave equation migrated (WEM) (lower right) without SWIM. Uplift of internal stratigraphy within the horst blocks is clearly seen in the WEM image. Source: PGS. The areas of most interest within the Troms-Finnmark Fault Complex are also the most difficult to image. The large horst blocks present, which hold the greatest potential for trapping hydrocarbons, are masked by the shallow gas clouds sitting in the overburden. This, together with the overall hard seabed found in the Barents Sea, has made confident interpretation of these horst blocks difficult. The imaging challenges arising from the high levels of attenuation/absorption of the seismic energy, leading to loss of the higher frequencies, have meant the internal stratigraphy is difficult to map clearly with conventional Kirchhoff migration. The survey design, alongside shooting in the dip direction to the major fault trends, has maximised the energy penetrating through to these horst blocks by enabling rays to dive underneath the highly attenuating shallow gas. This has allowed the recording of a broader seismic bandwidth to be input into the state-of-the-art processing workflows. The CWI workflow is designed for accurate velocity model building and high resolution depth imaging. It is particularly suited to areas with a complex geological overburden and the resulting depth-migrated dataset accurately depicts the subsurface without compromising the integrity of the dataset. CWI is a combination of reflection tomography, full waveform inversion (FWI) and separated wavefield imaging (SWIM), using the up- and down-going wavefield recorded by the multicomponent streamers to improve resolution and illumination, especially for the shallow section. To extract more information beneath the shallow gas, Wave Equation Migration (WEM) and Reverse Time Migration are also being applied. These techniques have previously been used to illuminate structures beneath ooze bodies in the Norwegian Sea, around the Aasta Hansteen discovery, and have been adopted here to enhance the signal underneath the shallow gas bodies. Figure 2 shows the preliminary uplift in the target areas where energy up to 60 Hz has been retained (by applying a bandlimited migration) on the internal stratigraphy underneath the attenuating surfaces. Following the application of the preliminary WEM results, a more stable reflector is evident between the horst blocks and this can be correlated across the structures. PGS has also acquired towed streamer electromagnetic data over the area and this data indicates resistive anomalies (up to 70 Ohm m) confined within these structural closures. Figure 3: 3D image of the KPSDM data showing a timeslice at 0.5 seconds TWT and a seismic section (cut at 0.5 seconds TWT) running south to north within the Tromsø Basin. On the timeslice several palaeopockmarks are seen and the seismic section reveals a large deltaic section and an interesting seismic anomaly. Source: PGS. One result of the advances in imaging technology is the vastly improved resolution, revealing intricate geology in this previously underexplored area. The dataset over the Harstad and Tromsø Basins has exposed a thick cover of Tertiary sediments where there are indications of a high level of geological activity throughout the period. Numerous unconformities and faults cut through the Tertiary sequences, and there is a large deltaic sequence with well-imaged clinoform beds, probably deposited in Eocene times (Figure 3). In addition, many channel systems can be seen at various depths, which are good indicators of the presence of sand in the basin. There are several potential seismic anomalies present within the Tertiary, giving high confidence for the presence of a working petroleum system in the area. For example, Figure 3 shows large areas littered with palaeo-pockmarks. These fluid escape features can be seen on different palaeo-seabeds in large areas within the basinal part, suggesting that they are related to several episodes of fluid expulsion and upward migration. Other fluid escape features, related to the deeper salt bodies present in the northern part of the dataset, are also evident. 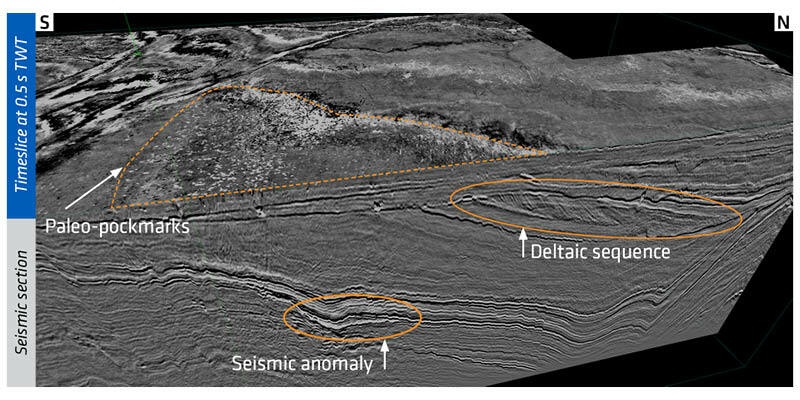 Some large potential seismic anomalies appear to occur within a series of rotated fault blocks that clearly detach from a distinct surface in the Tromsø Basin. This dataset also images many structures in the Troms-Finnmark Fault Complex, with both faults and stratigraphy sharply imaged, enabling more confident interpretation. The faulted terraces and horst structures are believed to have the greatest hydrocarbon-bearing potential within the pre-rifted Late Triassic to Mid Jurassic Realgrunnen Subgroup. Here, the Stø Formation is expected to have good quality sands deposited in a shoreface and coastal plain setting. In addition, the Early–Mid Triassic Havert, Klappmyss and Kobbe Formations might have potential in fluvial deltafront deposits. The seismic data also indicate evidence of sand facies in the Early Cretaceous pre-rift sequence together with the syn-rift sequences of Mid to Late Cretaceous. It is likely that the deeper plays found in neighbouring regions in the Barents Sea may also be prospective here. On the Finnmark Platform Late Permian shoreface sands of the Røye and Ørret Formations are thought to be present, potentially underlain by karstified carbonates similar to those observed on the Loppa High, offering additional potential prospectivity here. The discovery rate in the Norwegian Barents Sea is still slow after almost 40 years of exploration and more than 100 wells, even with increased industry interest over the last few years. It is still difficult to make good exploration decisions using only poor quality vintage data. Therefore, it is time to acknowledge the need for higher quality seismic data to be able to de-risk future exploration. The PGS17011NBS dataset, with its advanced imaging workflow together with a tailored acquisition setup, is solving complex imaging challenges to deliver a dataset that clearly exhibits many features of interest, both from a geological and petroleum prospectivity perspective. 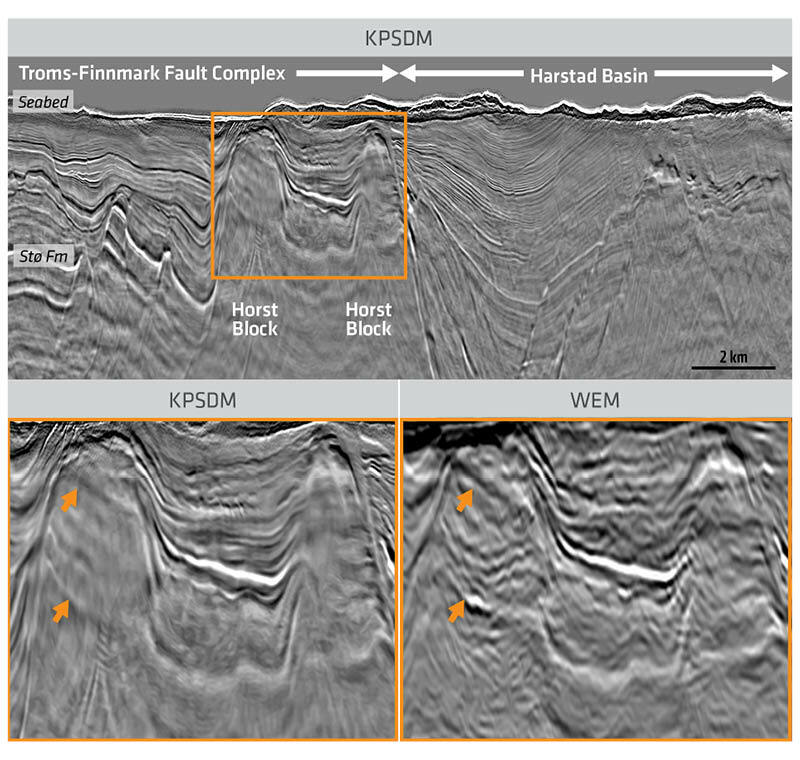 Fast-track data is available now together with the high resolution KPSDM (stretched back to time) for the first 2 s. This enables immediate assessment of the Troms-Finnmark Fault Complex and the Tertiary section of the Tromsø and Harstad Basins. Recommendeding GEO ExPro articles relating to the geology of the Barents Sea and associate hydrocarbon exploration activities. Atlas of the Geological History of the Barents Sea Editors : Morten Smelror, Oleg V. Petrov, Geir Birger Larssen and Stephanie C. Werner. Geological Survey of Norway, 2009. While one giant and several major discoveries have stolen the media headlines, the future bread and butter for the Norwegian continental shelf will to a large extent be the discovery and development of small and medium-sized fields. Although some major oil producers view the prospects offshore UK as too small for their attention, their exit leaves interesting opportunities for smaller companies. Prime Minister, Keith Mitchell, confirms the country's first hydrocarbon discover.